Victoria’s Energy Minister Liliana D’Ambrosio took a packed house of All Energy 2017 attendees through the state government’s approach to renewables, energy efficiency, storage and energy innovation as Australia’s largest PV show got underway today. She also mapped out the timeline for the Victoria’s long-awaited large-scale auction. Victoria’s Energy Minister Liliana D’Ambrosio, speaking at All Energy 2017, outlined a comprehensive clean energy program for the state. It was standing room only at the Plenary Session of the 2017 All Energy trade show and conference today in Melbourne, with attendees being turned away from the 500-person capacity conference room. There was good reason for the high level of interest, as the host state’s Energy Minister revealed the timeline for the state’s first utility scale solar and wind auction – which she referred to as its “mega auction”. The auction will be for 650 MW wind and solar projects to be developed in the state. 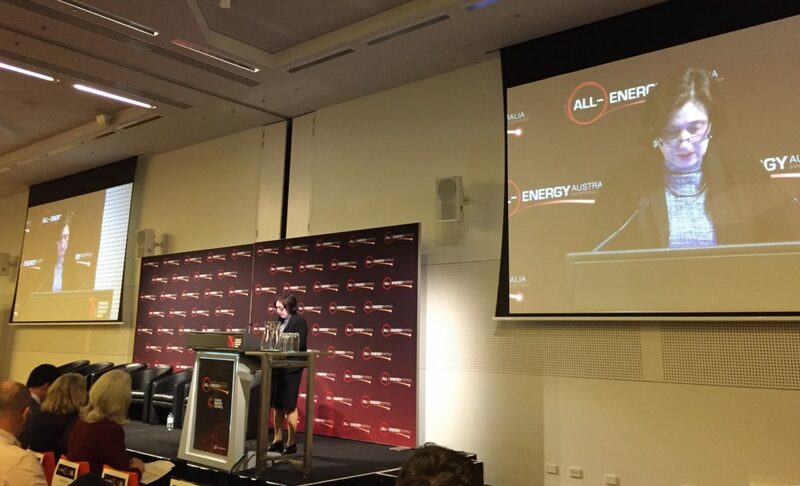 Addressing the packed house, D’Ambrosio noted that registrations for the two-day All Energy Australia show were at all-time highs. The Victorian Energy Minister went on to map out some detail as to the state’s renewables “mega auction. She said that by the end of this month expressions of interest will be called for, and details of the auction design revealed. In all, the Victorian government aims to complete the process by September of October 2018. The large-scale auction will play a large role in the state’s strategy for meeting its 40%-by-2040 renewable energy target – known as the VRET. Regarding the criteria by which successful tenders will be awarded, D’Ambrosio said that price, while important, will not be the only metric used by the government to select winners. She set out value to the local economy, local content, and the use of complimentary technologies, as being values by which applicants will be assed. While contributing towards the VRET, the successful projects will also be surrender Large Scale Generation Certificates (LGCs), D’Ambrosio said – which sets it apart from the Australian Capital Territory’s reverse auction mechanism earlier this decade. The 650 MW of large scale projects will be additional to wind and solar projects already being supported by the Victorian government, including two PV power plant projects currently under construction and scheduled for completion by the end of 2018. The projects are the 100 MW Bannerton Solar Park and the 38 MW Numurkah Solar Farm. D’Ambrosio appeared to take a swipe at the Federal Government while outlining the “mega auction” process and renewable projects under development. The Federal Government at present appears to be moving towards abandoning a Clean Energy Target (CET)mechanism recommended by the Finkel review – which itself was initiated a little over 12 months ago. The Finkel review, the Independent Review into the Future Security of the National Electricity Market, recommended that a CET be put in place, to provide investors and renewable energy project developers the policy stability required, beyond 2020, to get large scale renewable projects off the ground. The CET has received report from a very wide range of energy market participants, from utilities, through to project developers, IPPs and even large energy consumers and miners such as the Australian resource giant BHP. “These [the VRET and reverse auction] are examples of our government providing investors the stability they need to do business in our state – and we are quite unashamed about that,” said Victoria’s D’Ambrosio.